IGT casino software developer is the company behind the popular and famous video slots series, Dungeons and Dragons. The latest slots edition is Dungeons and Dragons: Treasures of Icewind Dale slot machine game. Further, the features in the new version are enhanced to facilitate wins and encourage players to keep playing either on a free basis for fun or for real money. 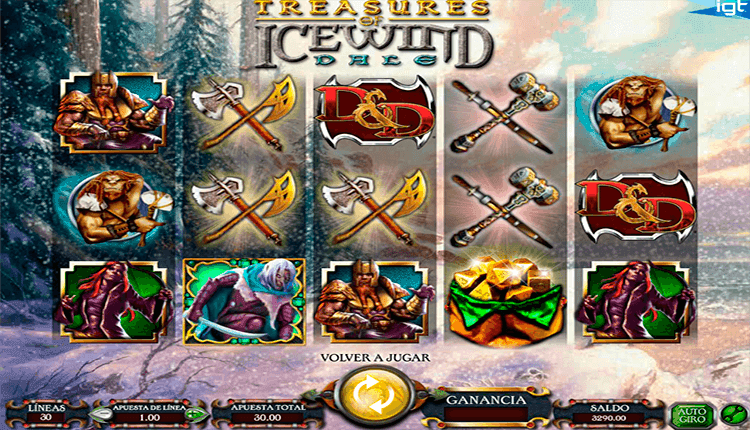 The online Dungeons and Dragons: Treasures of Icewind Dale slot machine game has 5 reels, 3 rows, and 30 pay lines. Symbols on the game include Drizzt, Wulfgar, Catti-brie, Bruenor. These are the four-hero symbols that act as wilds. They are the warriors that traverse the icy lands with snowstorms killing anything on their way as they edge closer to hidden treasures in the icy lands of folklore. Other symbols include dice, sword and axe, hammer, bow and arrows. The icons are plated in gems and come in doubles to signify real action in a ruthless and harsh terrain. The theme of the slot machine Dungeons and Dragons: Treasures of Icewind Dale is that of fantasy or epic treasure hunting. This is due to the background impression of frozen lands being battered by a gruesome blizzard. The heroes/knights have to use strategy and carefully analyze the maps. The role-playing that is supposed to take place is that you have to hit the winning combinations and also get weapons that can decimate savages on the way to win a jackpot of 25,000,000 coins. For online gamblers who have played any Dungeons and Dragons slots, the Treasures of Icewind Dale slot machine is easy to get started. The first step is to select the lines on the tab at the leftmost side of the screen. The second step is to determine the stake at the total bet by setting the coin value on the second tab at the foot of the screen. The minimum bet per coin is 1p. The next tab shows the total bet amount as per the line selection. There is also the “play again” tab for re-spinning the reels. Lastly, the “auto spin” spins the reels for a given number of rounds. In the Dungeons and Dragons: Treasures of Icewind Dale free online slot game, your main aim is to hit the hidden treasures of the Icewind Dale. These treasures are found in the bonus games that include the dragons and the wild dungeon found in the dynamic stacks. The bonus symbols are the bags of gold and the dice. They all unlock bonus rounds that are vital in the overall payout. The bonus bags of gold triggers the total bet multipliers and free spins-3 and more bonus symbols trigger 15 free spins that can total up to 225 for the whole game. 12 dices turn any hero into wilds regardless of the position on the reels. Interestingly, the dice accumulator tracks the progress and activates any hero into a wild once the 12th hit is attained. The 4 heroes are the wilds, and there are no scatter symbols. They appear on all reels except the first and replace all icons. The play table for Dungeons and Dragons: Treasures of Icewind Dale slot machine is, however, not progressive and the variance can range from medium to low depending on the strategy of a player. For online gamblers to beat the house edge at an RTP of 96.52% and get the jackpot of 500 coins, it is recommended to stake the highest bet and spin the reels where the heroes appear. Free casino games can be played on a no download, no registration basis at our site on a browser. The free online Dungeons and Dragons: Treasures of Icewind Dale slot machine is also available on mobile apps as IGT has incorporated the HTML 5 technology to support Android or iOS smartphones video specifications. It is recommended that players should play Dungeons and Dragons: Treasures of Icewind Dale online slot for real money in certified and accredited online casinos only. The deposit for betting can be made from visa that can also accept cash payouts when a player withdraws prizes. Other than following the processes highlighted on the gameplay, getting started on a real money online slot machine is straightforward and easy. Replay and auto spin tabs are vital in spinning the wheels which cascade/tumble rather than spin as is the case in other slot games. The winning tab on the foot of the screen is activated on a cash game and highlights in real time the amount of cash that a gambler has managed to win. The bonus features as you play Dungeons and Dragons: Treasures of Icewind Dale slot machine are the key to hitting the 500-coin jackpot and other cash prizes. There are no low-value card icons that slow down the progress of winning. Further, free Dungeons and Dragons: Treasures of Icewind Dale slot machine online is an ideal online casino game for fun.